Blues, country, rock ‘n’ roll, and others, the harmonica is found most everywhere in the music spectrum. 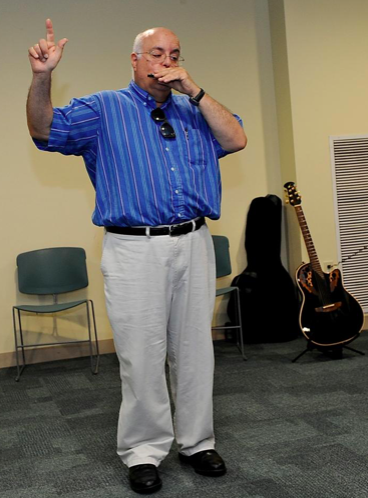 With a few breaths of air, musician Lou Manzi pushed some twangy blues out of his harmonica at the Medway Library on Wednesday afternoon. He was showing off techniques like bending notes, and using his hand to make what he called a “wah-wah” sound, during their bi-weekly lesson. Manzi led this lesson, filling in for regular teacher Rob Fletcher. Manzi recapped the basics before getting into the blues and rock ‘n’ roll techniques that create a great harmonica player. He has been a musician since the 1970s, playing in bands, teaching guitar, and doing other projects. Now retired, he plays with a swing and blues band called The Howling Hound Dogs, and teaches lessons. He said the best way to improve while learning the harmonica, like anything else, is practice. The challenge, he said, is getting to know the instrument more intimately by practicing each note one at a time, and mastering it. He said it isn’t as easy as it looks, but he can make a good harmonica player out of anyone. After about 40 years of playing, Manzi said he’s still not the harmonica master he wants to be, but there’s always room for improvement with any instrument, and he’s still learning. A group of budding blues players of all ages on Wednesday learned songs such as Billy Joel’s Piano Man to Beethoven’s Ode To Joy. 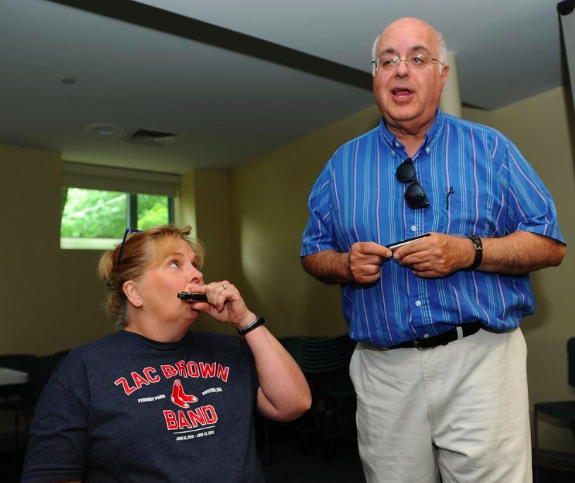 “We’re very interested in music, and I just love exploring new options,” said Holliston resident Nicole McWilliams, explaining why she joined the class. Her son Andrew McWilliams, 11, took the lesson with her. Andrew brought along his own harmonica collection to flaunt during hour–long session. Some had more personal reasons for wanting to learn. Medway resident Pat Mailman said she’s following the legacy of her father. When it comes to the instrument, Manzi said there is a lot that sets it apart from others. 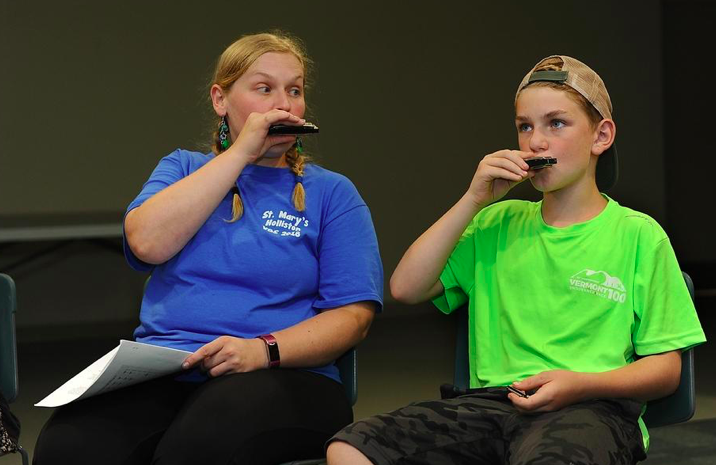 Being able to manipulate one sound in a variety of ways is what makes the harmonica so versatile among music genres. This entry was posted in Music, Quest Stories. Bookmark the permalink. Both comments and trackbacks are currently closed.